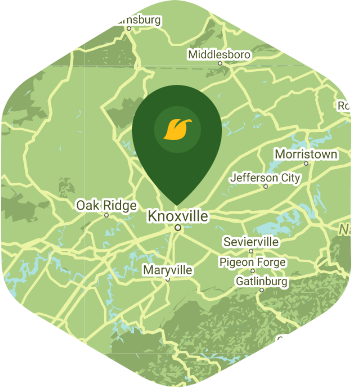 Book a skilled lawn pro in Knoxville. Backed by a total satisfaction guarantee and amazing customer support. You very well know that you are already in Knoxville if going to World's Fair Park is just like a daily walk in the park. With a hot temperature during the summer, the Park is just the right place to be with its grassy mounts, fountains, and cemented walking trails. You can always chill and relax while gazing at the Smoky Mountains and the Tennessee River. But of course, you wouldn't be able to do so knowing that your lawn is probably in urgent need of aerating due to the summer heat. Lucky for you, Lawn Love offers lawn care services including lawn aeration. Lawn Love is here to help you punch some holes into your soil to make sure that your soil is moist with enough oxygen and nutrients to make the soil healthier, hence, producing stronger and long lasting lawn. Our independent lawn technicians have at least 10 years of experience in aeration and other lawn services. They even use specific equipment to make sure that the soil is aerated properly. These services are even offered at an affordable price! If you want to experience some magic in your lawn, give us a call at 865-219-2547 or why don't you try and get a free online quote here in just about two minutes! He did a great job. Professional and courteous. Went above and beyond my expectations. My lawn was significantly overgrown and I could hear the equipment struggling, but he slogged through it and remained professional. I was impressed that he still took his time and did a great job. Sammy removed a pile of brush I left after trimming back a shrub. My lawn is pretty large and thick. Chris and his crew did an outstanding job and communicated to try and find a solution to my excess clippings problem. Very nice and professional crew. This week Chris touch up the spots that I felt needed detailing and it looks GREAT!! Thank you for your care with my yard!! Did a great job and did it quick. Chris did a great job! The lawn looks great!!! Love, love, love my service! Sherman and his crew were awesome. My yard has never looked so good!! Awesome job on the yard and his communication is was above and beyond. top-notch professional. great work and service!!! He was very nice and did a fantastic job! We needed that cut so bad (as you could see) -yard was more like a meadow than a lawn. Previously let down. Thank you. I highly recommend Luke! The absolute best lawn experience I have ever received! The work is wonderful! He goes above and beyond and cleans up work area very well! Nice , professional and got the job done quick and efficient. Love what you did. Realise the lawn needs some tlc to be its best but limited funds/ time. Rated 4.71 / 5 stars in 258 Knoxville customer reviews. There won't be any rain in Knoxville today, which means you'll probably have to water your lawn. Dusk and dawn are the best times to water your lawn (the sun will rise at 6:57 AM and set at 8:13 PM today in Knoxville). Here are some average aeration prices for homes in Knoxville. Average lawn size 8,626 sq. ft.